We are digging into Apple’s recent announcements today, with a heavy focus on Apple Card. When Apple made its announcements and Apple Card was included…I knew I needed to create an episode on this topic. Apple made a series of star-studded announcements about their new offerings, which included the announcement of Apple TV+, Apple Arcade, Apple News+ and, of course, Apple Card. An interesting aspect of these announcements is that they didn’t talk about anything that is available yet, and didn’t include any pricing information. In this behavioral economics podcast, I’ll tell you why this was their true genius. It’s different from previous announcements, but they are also taking a huge turn by switching from products to services. As we dig in, I’ll explain where Apple did some really smart things and took a strategic approach to these announcements and their shift in offerings. Plus, tips for you to take away and apply in your own business. Disclosure: Specific details were accurate at time of recording. Policies are subject to change. Find the most current details at Apple.com. [03:02] When Apple made its announcement, I knew I needed to talk about the Apple Card. In last week’s Facebook Live I also let talk of the Apple Card run the discussion a bit. I did tie it back to the topic of loss of version and anchoring and adjustment, though. [04:21] Last week, Apple made a series of star-studded announcements about their new offerings, which included the announcement of Apple TV+, Apple Arcade, Apple News+ and, of course, Apple Card. [04:43] People think it’s weird that Apple didn’t talk about anything available and didn’t disclose any pricing. In reality, this is the true genius behind the announcement. [05:09] It’s justified for Apple to make a shift, because they are changing their offerings from products to services. [05:30] People aren’t logical. People say they think and will do one thing…but their subconscious will often think different (Apple ad throwback alert!). 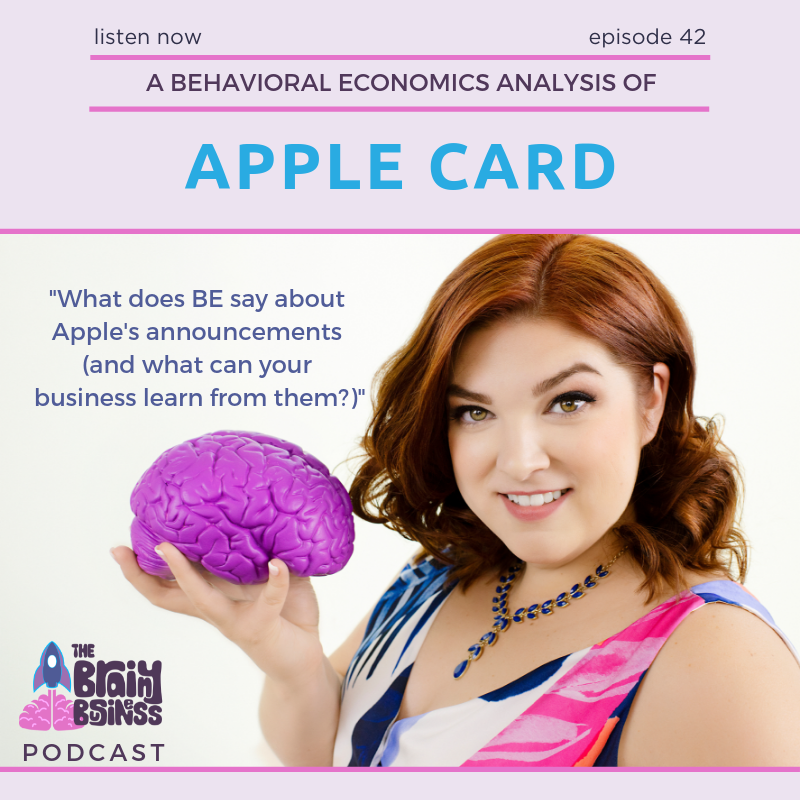 [06:15] When we look at the announcement from a behavioral economics point of view, we’ll see a lot of smart things that your business can use or learn. [07:03] In the episode I will talk about building anticipation and expectations, the delayed pricing strategy, subscription models, framing, herding, how familiarity breeds liking, and the value of celebrities. [07:20] BUILDING ANTICIPATION AND EXPECTATIONS While it has generated a lot of complaints from our logical brains, I would argue one of the smartest things Apple has done is announced all the greatness of the services before they are actually available. [10:39] We thrive on the excitement of anticipation. [11:23] BUT having anticipation creates loss aversion and perceived ownership, which also means you are much more likely to feel the need to experience the treat at the end or to at least test it out and see how it meets or exceeds your expectations. [11:51] Being top of mind is key in influencing buying behavior. [13:06] Far too many organizations wait to announce a launch until it is actually launching. In reality, people need time to get really excited about things. [13:41] High expectations are okay (as long as the actual release isn’t a total fail), because studies show that the brain gets what it expects. [14:44] Building expectations of greatness means people will expect this thing to be good – and we expect it to be really REALLY good if they went out of their normal strategy to announce it before it was ready. [15:12] THE DELAYED PRICING STRATEGY The truth about pricing is price never about the price. Everything that comes before the price matters much more. [15:36] Creating value is about framing and anticipation…which Apple is taking time to let ruminate before the pricing is announced. [16:27] HERDING This also allows for herding behavior to be triggered earlier than it would otherwise as people start talking about the products. [20:46] THE VALUE OF CELEBRITY Our brains love celebrities and we associate all their qualities with the brand of Apple directly now. [21:44] HABITS AND SUBSCRIPTIONS Apple is jumping on the subscription train. [24:57] Apple Arcade is an aggregator of games: all you can play, across all your Apple devices, with NO ads and a commitment to privacy. [25:21] FRAMING People have said what they want. Apple is framing their new offerings with the things that people have said they want. [25:38] Apple Card is a framing story more than anything. [25:57] A lot of the functions and features being touted in Apple Card already exist. [26:12] Apple asked a better question to uncover what people care about, and then (here’s the kicker) they found a way to frame the product and message so it is within those parameters. [28:12] Why haven’t other banking institutions offered “no fees ever”? They are too close to the situation. [29:48] The rates on Apple Card (13.24% – 24.24%) are reasonable for a rewards card. [30:47] There is no fee for late payments, but late payments accrue additional interest. [32:31] Apple was able to look at a product with fresh eyes and shape their offering in a way that gives people what they want. [33:57] Look at framing your products to be most appealing – and then look at how you are framing the message of communicating that across the organization and to customers. [34:34] INCENTIVES Another thing Apple Card is doing really, really well is their cash back offering. [36:07] The most important thing they have done from a behavioral economics sense is bringing the reward as close to the trigger as possible. [36:29] Instant payouts mean lots and lots of positive associations with the card. [37:36] If you give benefits of any kind back to your customers, how can you make it real, tangible, and as close to the behavior you want repeated as possible? [40:23] Framing matters – how the product is framed and the message around that product. Introducing Apple News+ Everything you love about News. Plus.